When we say “custom” full color digitally printed banners, we really mean it. We print anything you want, so you’re not limited by size, number of colors, etc. Your choice of finishing options and coating finish too. See below for more info on our banner material options and their pricing. All banner materials are for indoor or outdoor locations. Our standard 13oz Scrim Vinyl Banners are tough and durable, perfect for indoor or outdoor use. We include a UV/Scratch resistant liquid laminate in your choice of semi-gloss or matte finish. Finishing options of grommets or pole pockets can be added at no extra cost. If you’re needing material that has a printed image on both sides, then our 15oz Double Sided Scrim Vinyl Banners are what you want. Much like our single sided variant to the left but with a block out layer in between to ensure there is no image bleedthrough on sunny days. Adhesive Window Film: You have probably seen this before in store fronts or on the windows of inner city buses. One-Way Vision Window Film acts much like a two-way mirror. See a full color printed graphic on one side, and see right through the other! The entire thing is kind of an optical illusion really, pulled off with a combination of material, perforation, and color. It has a 50% perforation, meaning it is half holes, half material. The back (see through) side is black and has an adhesive on it that allows you to stick it right onto your windows. It can be installed in panels much like you would install wallpaper. Being "semi-permanent", it can last for years yet can be removed without damage to your windows (once removed more than likely it will not be reusable). We can digitally print any image or design you would like on the front side. In order for the one way effect to work to its fullest, the front printed side must be well let. Non-Adhesive Window Film: Much like the above adhesive variant but with a few small changes. This type is commonly put up on the inside of windows. There is no adhesive backing. You can either A) Free hang it anywhere or B) For an additional 50 cents a square foot we can apply a mild, clear adhesive to the front side after it has been printed. This print side adhesive is gentle enough that you can usually take it down later without any damage to the print in case you want to relocate it. There is also slightly less perforation with this variant (only 30% perforation) which boosts the image brightness to help offset any glare or reflections on the glass between your print and the viewer. Excellent for advertising in areas where signs aren't permitted, this car topper displays 23.5" by 10.25" on the 2 large sides and 9.75" by 8.25" on the 2 smaller edges. 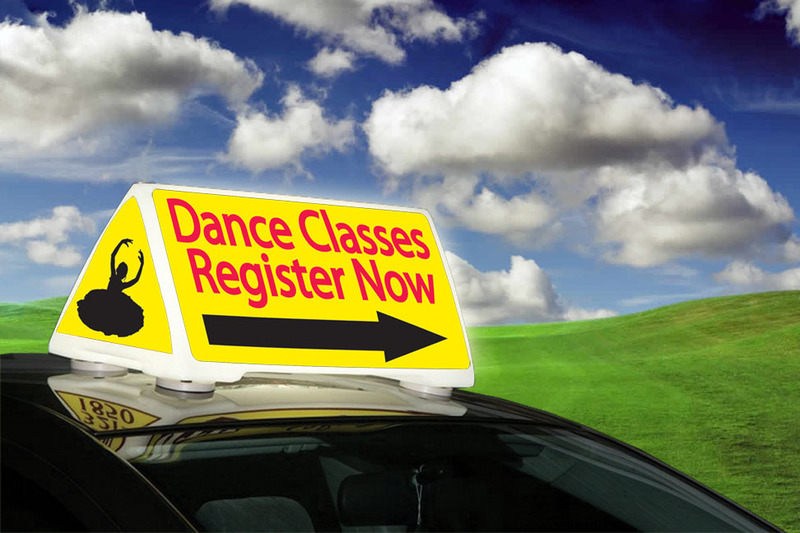 This car topper has a powerful magnetic system that will hold the sign in place firmly but will not scratch or chip paint. Sign includes incandescent bulbs (available for an upgrade to a rechargeable LED light system), and anti-theft device, UV resistant graphics to protect from fading. 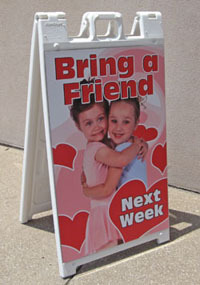 A-Frame Sidewalk Stands allow you to quickly set up small and portable yet stable outdoor (or indoor) signage. They fold up and have a carrying handle for quick transport and storage. The stands themselves are hollow to allow the addition of water or sand to weigh them down, giving even more stability. Each stand comes with two interchangeable full color printed panels (one for each side) that are 2' wide by 3' tall. Each panel is digitally printed PSV on 3mil Sintra Board and attached with heavy duty Velcro, allowing you to order additional panels that can interchange easily. 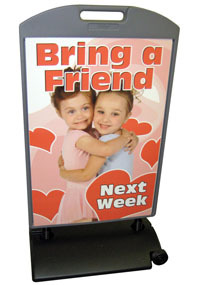 Premium Sidewalk Stands use the same 2' wide by 3' tall interchangeable panels that our A-Frame Sidewalk Stands use. Unlike an A-Frame, they have a wide base with wheels for easy repositioning (which can be filled with water or sand for extra weight and stability) with a single double sided frame attached with springs for wind resistance. The panels slip down into each side of the frame rather than relying on velcro to attach. Our Premium Sidewalk Stands are perfect for areas that get a lot of heat or wind. One of our brand new and most versatile products. Fabric stickers have the amazing ability to stick on almost anything, then be removed and relocated again and again and again. They are wall safe as well, so feel free to use them anywhere indoors. They can even hold up for several months outdoors. The material is very tough and durable: almost impossible to rip or crease. You can crumple it up on itself and it's forgiving enough to unstick from itself and then restick to something else. Heck, we've even WASHED this stuff before and it still somehow stuck. Great for somewhere that you need quick and easily installed signage without many options for installation. One neat use: life size cutouts of people! You've asked for it and it's finally here. Just like any of our products, we can print ANYTHING on a whiteboard with our full color digital printing. Then, you can draw right over whatever is printed on your board, and erase it of course! No cut vinyl that you can't write over and that stops your marker. No limit to color or shapes. Print anything, then draw anything. Great for hospitals, educational institutions, music teachers, restaurants, organizational charts, callendars, sports events, architects, and more! Aluminum frame with marker tray at bottom, small strip of cork board on top, sturdy construction, magnetic receptive. Comes with 4 colored markers and a standard terry cloth eraser. Since your new custom dry erase board is magnetic receptive, why not get some interchangeable panels with magnetic strips that allow you to stick them up on your whiteboard? Each panel is custom printed and comes with two strips of magnetic material on either side which allows them to stick perfectly to the center of your dry erase board. The panels are coated with the same dry erase overlaminate, ensuring the same quality performance. They are thin enough that they can even be rolled up and stored wherever needed. © Copyright 2009 Better Banner Printing, All Rights Reserved. This site best viewed in Internet Explorer 7.